Understanding and interpreting D&O liability and coverage issues involves studying the evolved terms of the corporate liabilities presented, the contract terms implicated and the case decisions interpreting those terms. 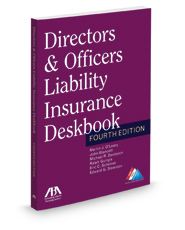 Now updated, The Directors and Officers Liability Insurance Deskbook has evolved with the expansion of corporate liabilities, the terms of the policies at issue and the judicial interpretations as well. Use this book as a reference tool for navigating the current landscape, providing synopses of important judicial decisions (in various jurisdictions) on the key provisions that commonly arise. This book reflects on this history of directors' and officers' exposures and the insurance coverage called upon to address those risks.